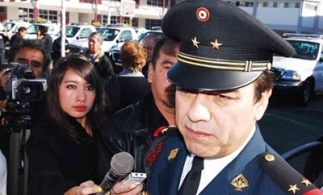 Police Use Brute Force to Break Crime’s Hold on Juarez ~ ESCRITORES POR EL MUNDO . There appears to have been a security miracle in Ciudad Juarez, once one of the world's most violent cities. But while some applaud the city’s police chief, Julian Leyzaola, others fret about his near-systematic violation of human rights. Leyzaola’s arrival in March 2011 coincided with a dramatic drop in crime and homicide levels; the homicide rate is now one-fifth of what it was in that month. In November, the city had 27 murders, its lowest monthly number in nearly three years. The homicide rate, which reached an astounding 10 per day at one point, is down to about one per day. While this is still very high, the situation in Juarez now seems manageable. Other crimes, such as extortion, kidnapping and car theft, have also dropped precipitously. Complaints of extortion are one-third of what they were 18 months ago. Kidnapping is reportedly at one-quarter of what it was at its peak. In early 2011, there were two months with 540 incidents of violent car theft; in December, 2012, there were 56. Leyzaola, a retired lieutenant colonel, is all about confrontation. He has spent his tenure pushing police onto the streets, where they arrested anyone whom they saw as a threat. The numbers of arrests are as stunning as the crime statistics. In January 2011, the police arrested 1,462 people for suspected misdemeanors. In July 2012, that number was 13,568. Many of those detained pay fines for violations such as failure to carry proper identification. Others lose a half-day’s work. The result, say critics of Leyzaola, is that people are turning against the municipal government’s security plan. One case illustrates the intensity and troubling nature of this policy. On February 17, 2012, the police arrived at the house of Victor Ramon Longoria Carrillo. Without a warrant, the police entered the house, shoved Victor into his room, covered his head with a sack, and beat him. Victor, his sister, his wife, and two of their neighbors later testified that the police eventually dragged Victor into a van and drove away, without telling the family where they were taking him. The family followed the police in their own car until a military caravan stopped them, and the police continued to the station, where Victor said the beatings continued. The police -- according to Leyzaola’s testimony to the Chihuahua State Human Rights Commission, which investigated the incident -- were following a lead from three suspects who’d car-jacked an H2-version Hummer earlier that day (see full investigation - pdf, and El Diario's account). The suspects said they’d stolen the car at the behest of their bosses, one of whom they identified as Victor. Two other alleged ringleaders were arrested along with Victor that same day. The men, the police said, had several AK-47s and munitions. One of them, they added, was alias “Kiko,” a local criminal leader. However, the commission found serious discrepancies in Leyzaola and the police’s story. To begin with, Victor’s house is nowhere near where the other two suspected leaders were arrested. The commission said Victor was arrested in his house, as he, his sister, his wife and the two neighbors testified. The commission added that the police had committed an illegal search and seizure at that house, and asked the municipal government to sanction the officers. The police do not hide their aggressive stance. Leyzaola did not agree to an interview. But others in the police who spoke to InSight Crime said there was no hidden agenda. In fact, the police flaunt their aggressive tactics, calling them the “attack” (“choque”) phase. They believe that it can help them revive morale, belief in the institution, and respect from the populace and criminals alike. Juarez’s mayor, Hector Murguia, has the same attitude, reportedly telling people that he’ll leave before anyone gets rid of Leyzaola. The tricky debate of how to balance securing the city and protecting human rights often comes to a head at Juarez’s citizen-run security committee, known as the Mesa de Seguridad. The Mesa was formed after the brutal January 2010 massacre of 15 teens, who were mistaken by their killers for members of a rival gang. After the attack, President Felipe Calderon visited the city and met with civic and business leaders. Together they formed a series of working groups, or mesas, among them the Security Working Group, or Mesa de Seguridad. The members of the Mesa are not Juarez’s wealthiest. They are a mix of lawyers, doctors and businessmen. Some have security backgrounds. Most are citizens who decided to get involved as the security situation becomes dire for them, their relatives, their neighbors and their colleagues. Now they find themselves on the front lines. The Mesa has become an important broker for security issues. Citizens who have a problem and do not trust the authorities will often call someone from the Mesa, who will call a trusted member of the security or law enforcement community, who will act on the tip. The result can be immediate, as illustrated by the drop in complaints about extortion. To be sure, lowering extortion rates was at the center of the city’s security plan. Leyzaola did his part by passing out his personal phone number to shop owners in the city’s center. Those who called were surprised to get the lieutenant colonel himself on the phone. After speaking to the shop owner, Leyzaola would give his officers a description of the suspect or suspects who had collected or threatened to collect the weekly quota, and the officers would pick them up. Leyzaola would then get the shop owner back on the telephone, while the officers would drive the suspects up and down the street. When the squad car passed the shop, the owner would tell Leyzaola whether those were the bagmen or not. That way, the shop owners did not have to put themselves at risk. The municipal police is just one institution that has changed leaders. A new Chihuahua governor, Cesar Duarte, cleaned house at the state Attorney General’s Office, including replacing its head, Patricia Gonzalez. Gonzalez was linked in press accounts to the Juarez Cartel, for which her brother was assassinated by suspected members of the Sinaloa Cartel (see video in "How Juarez's Police, Politicians Picked Winners of Gang War"). The most cynical observers say security gains in the city have come about because the Sinaloa Cartel has become the dominant player in the area. This may be, in part, true. But it is also shortsighted and places too much emphasis on the criminals rather than government actors. Indeed, several security officials, who spoke to InSight Crime on condition their names or institutional affiliations were not revealed, said the various Mexican security and law enforcement bodies were working together better than ever. They added they were sharing more information with their US counterparts, who provided real-time intelligence, allowing Mexican authorities to arrest high-level suspects. The Chihuahua and Juarez police are also restocking their ranks with new recruits and getting training from the United States. But the process is slow and illustrates just how fragile the security gains are. The Juarez police recently graduated its first class of recruits since Leyzaola’s arrival. Of the 3,000 applicants, 100 passed the battery of obligatory mental aptitude, psychological and polygraph tests. Of those, 81 made it through basic training. *Research for this article was paid for, in part, by the Woodrow Wilson International Center for Scholars. The author’s assertions do not, in any way, reflect this institution’s positions on matters of security inMexico or Ciudad Juarez. Read entire series - "Juarez: After the War"